Palma has always been a favourite excursion for people while on holiday in other parts of Majorca but in recent years it has developed into a real favorite destination in its own right with short stay and weekend break visitors. This vibrant city has all the ingredients for a top class mini break, great museums, architecture, great shops, medieval narrow streets, a wonderful cafe culture, atmospheric restaurants and if the weather is good you can be on the beach in minutes! This is a great choice for couples, families or groups looking for an interesting and fun packed time. The 'must see list' of things to during your mini break in Palma should include the impressive Gothic cathedral, the Bellver castle that towers above the city, Parc de la mar to see the fountains and stroll around the park, the Arab Baths a 10th century bath house located in the narrow streets near the cathedral with well tended gardens, Marineland a short journey out of Palma in Portals Nous or for a great day out take the tram train up to Soller that travels through the Majorcan interior. The beach resorts of Illetas or Cala Estancia are just a short taxi ride away. Weekends and short breaks are popular all year round, however the mild climate makes autumn and spring breaks an ideal time of year to explore this fascinating city. Palma is only a couple of hours flying time from the UK and with the availability of low cost airlines from all major and most regional airports it makes the trip to Palma a convenient and rewarding experience. 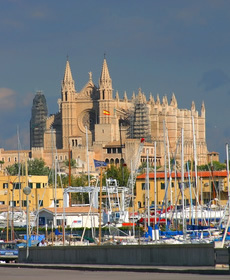 There is a good range of accommodation in Palma from 2 star bed and breakfast through to 5 star deluxe. 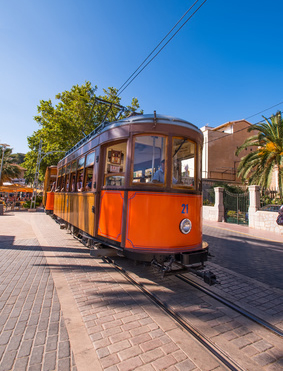 If you are travelling at a time of year when the weather is hot you could also consider the nearby Bay of Palma beach resorts of Illetas, Cala Estancia or C'an Pastilla all of which have easy and cheap transport links in to Palma by bus or taxi. Call us free on 0800 849 1285 or click here for a quote.